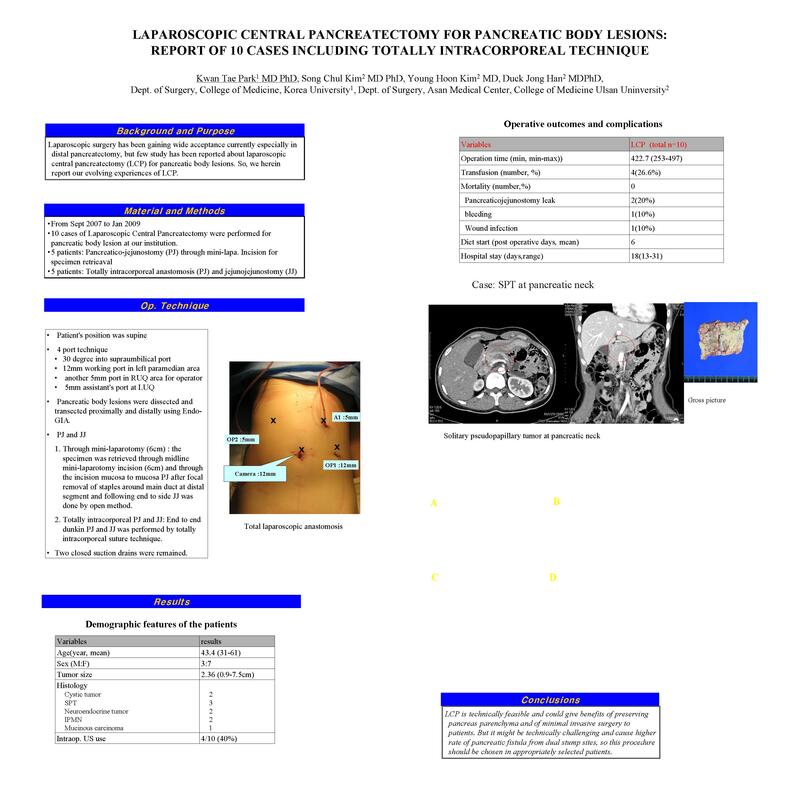 Introduction) Laparoscopic surgery has been gaining wide acceptance currently especially in distal pancreatectomy, but few study has been reported about laparoscopic central pancreatectomy (LCP) for pancreatic body lesions. So, we herein report our evolving experiences of LCP. Methods) From Sept 2007 to June 2008, 6 cases of LCP were performed for pancreatic body lesion at our institution. Patient’s position was supine and camera port was inserted in supraumbilical area and 12mm working port in left paramedian area, another 5mm port in RUQ area for operator and 5mm assistant’s port at LUQ respectively. Pancreatic body lesions were dissected and transected proximally and distally using Endo-GIA. For initial 5 patients, the specimen was retrieved through midline mini-laparotomy incision (6cm) and through the incision mucosa to mucosa pancreaticojejunostomy (PJ) after focal removal of staples around main duct at distal segment and following end to side jejunojejunostomy was done by open method. For last patient, duct to mucosa PJ and jejunojejunostomy was performed by totally intracorporeal suture technique. Two closed suction drains were remained. Results) Final diagnosis was 4 cystic tumor, 1 IPMN and 1 neuroendocrine tumor. All the cases had negative resection margins. Mean operation time was 430 minute (393-444).There was no PJ site leakage, but in two patients mild pancreatic juice leak was developed at the proximal pancreatic stump, which was stopped within postoperative 2 weeks with conservative treatment. No surgical complications except postoperative gastrointestinal bleeding requiring distal pancreatectomy in 1 patient were reported. Mean postoperative hospital stay was 15.5 days and they are all doing well now. Conclusions) LCP is technically feasible and could give benefits of preserving pancreas parenchyma and of minimal invasive surgery to patients. But it might be technically challenging and cause higher rate of pancreatic fistula from dual stump sites, so this procedure should be chosen in appropriately selected patients.